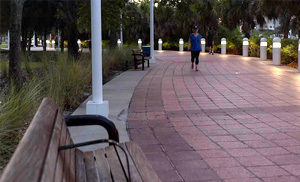 The Riverwalk provides access for anyone who desires to enjoy a walk, jog or bike along this continuous pathway extending from the Channelside area to Tampa Heights along the east side of the Hillsborough River. It incorporates pedestrian amenities, art and interpretive elements, retail and restaurants, and parks and open space. Our vision “to create a vibrant and interactive waterfront experience for residents and visitors that reflects the spirit and uniqueness of Tampa” has become reality. Waterfront park located along Garrison Channel in downtown Tampa. The 4.5-acre park includes playground equipment and a pier, as well as a memorial to the Seminole Indian Wars. MacDill Park on the Riverwalk is a section of a pedestrian path that winds along the Hillsborough River in downtown Tampa. Offers 3/4 acres of grassy comfort. Dog friendly but must be on-leash. 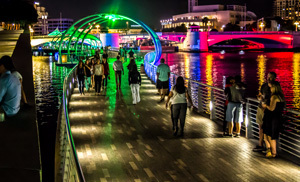 Curtis Hixon Waterfront Park attracts over one million people annually to its special events. It’s a place to meet and enjoy Tampa’s waterfront. Bring your children to splash through the water features or take your dog for a trip to the dog park. Julian B. Lane Riverfront Park is a stunning 25-acre park located just north of the University of Tampa and across the Hillsborough River from the David A. Straz Center for the Performing Arts. A riverfront park with open, green space, a dog park, covered and shaded picnic areas, a playground and a splash pad for children.